A fairy-tale style secluded cabin, sleeping two, nestled in its own private area of the garden. Our newest accommodation - a light and airy lodge opening out on to its own terrace with room for two adults and a child. It’s fairly common to leave a holiday and feel you didn’t quite manage to do everything – you can’t visit every beach, walk every footpath or drink your way through every pub (though, you may certainly try) – but to leave a campsite and feel you haven’t seen it all is quite a different matter. Somehow, however, this is exactly the aching feeling that follows you out the gate at Wyldwoods Eco Retreat. Like the proverbial giant onion, it is a multi-layered place with something new to discover every time you delve a little further. As if home to endless secrets, you can peek, poke and play around to your heart's content only to return again the next year and do it all again. Originally a vast and well-manicured organic garden that was open to the public, three and a half-acre Wyldwoods was left to nature for several years before current owners, Dawn and Tony, took over. Through their hard work the garden has been crafted back into gloriously colourful shape, while an element of its newfound wildness has also been maintained. The result is like something out of Frances Burnett’s The Secret Garden, a haven not just for humans but also for a wealth of native wildlife, with fledglings flittering between the thick, mature hedgerows and owls hooting in the night. 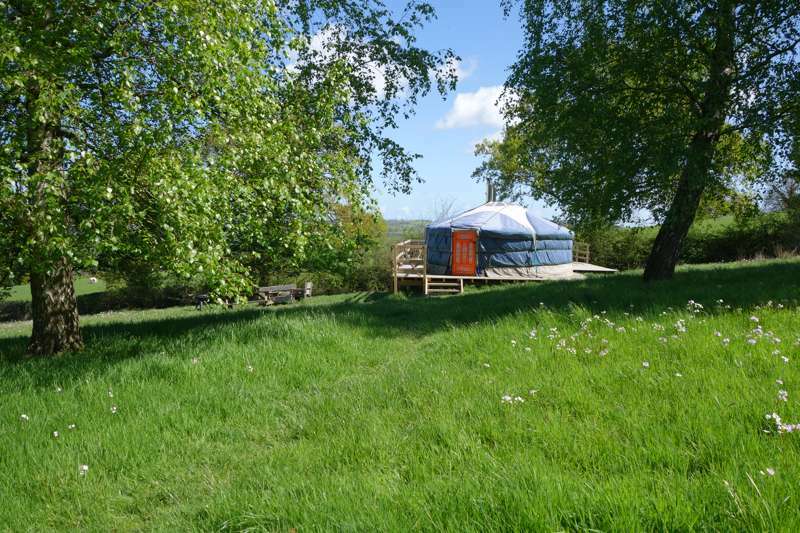 Nestled in two separate corners of the site – one on the edge of it’s own private lawn, the other it’s own terrace with views across the valley – two wooden glamping lodges are found. 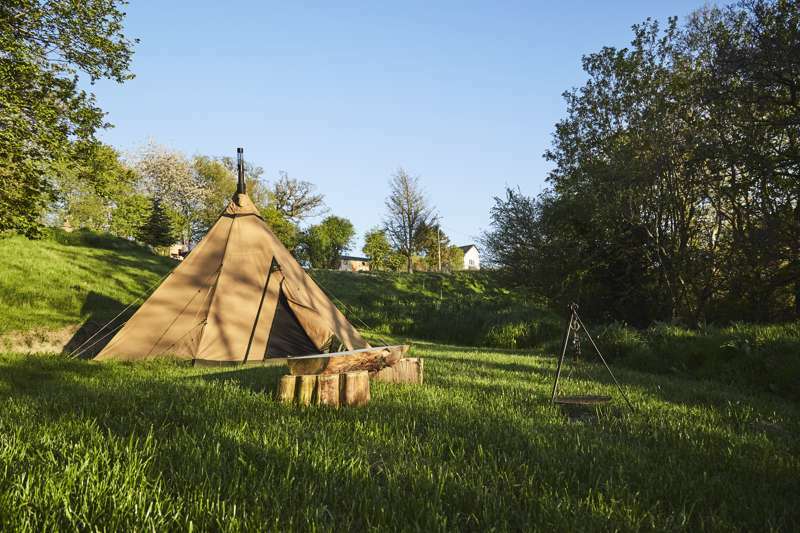 Both are kitted out for year-round glamping breaks, with a large double bed and wood burning stove that are perfect for bolting yourself away in the wilds of autumn, while outdoor furniture allow you to make the most of long, light summer evenings. Small attention to detail, like a supply of board games and romantic old-style lanterns, show the care that Dawn and Tony have put into the place, while their clear passion for the garden can be seen in the cabins’ more decorative items – branches woven with fairy-lights and horticultural pictures on the walls. Each cabin even as its own potager of herbs and seasonal leaves to enliven your dinner. With so many hidden corners to the site itself, three acres quickly feels more like three hundred and you could easily stay put without ever venturing to the Berwyn Mountains beyond. We do advise venturing forth at some point though – there's an entire world beyond Wyldwoods even if your nicely hidden away from it. Just remember, don't rush. You'll never feel like you've done it all. If you are looking for some peace, either alone, as a couple, or with your children, then you are sure to find it here in our large 3.5 acre organic garden with its private access to Pant-yr-Eos Woodland Trust forest. 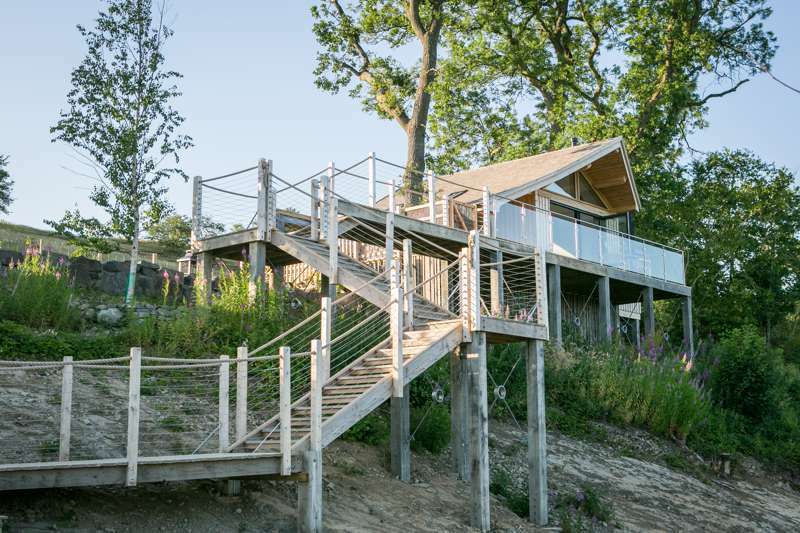 Stay in one of our two impressive lodges that are set quietly within their own garden or private terrace. Our guest accommodation is perfectly situated on the Welsh border, within 8 miles of the historic market Town of Oswestry, 5 miles from the unspoiled village of Llanrhaeadr-ym-Mochnant, with local food stores, fish and chip shop, post office, traditional butchers, restaurant and friendly pubs. Llanrhaeadr is famous for its spectacular waterfall which is the highest in Wales. Wyldwoods retreat is just 25 miles from the Medieval city of Shrewsbury with its cobbled streets and timbered buildings and 25 miles from the walled Roman city of Chester. A stay at our retreat is ideal for relaxing, bird and badger watching, hill walking, mountain biking,or visiting the many historic local sights, both man made and natural. 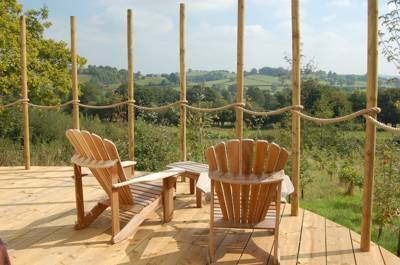 For latest availability and best prices for Wyldwoods Eco Retreat, please use the Date Search above. Fantastic long weekend over August Bank Holiday, Great quirky cabin, immaculately clean, Very well presented & equipped. Loved the flickering light of late dusk with the log burner lit. Tranquil garden surroundings with some stunning scenery and walks. My wife, daughter and pomeranian spent 2 great nights at this wonderful location. The setting is really hidden away and is great fun to find on the many narrow lanes, but the journey is worth it as the location is so tranquil and you really feel like you have escaped to a different time. The owners are so welcoming and friendly and always available if needed but happy for you to be left to your own devices if desired to enjoy the peacefulness. Within the accommodation everything you could possibly need has been thought of and is available for your use, and the room we stayed in was really cosy, and with the attached solar paneled shower room with sink, and enclosed compost toilet this is really luxurious in terms of glamping! The breakfast and supper provided were delicious (including soup made entirely from homegrown ingredients). Waking up and cooking the breakfast whilst enjoying the breathtaking views and listening to the sounds of nature was really great. Finally I have to mention the night sky, I have never seen a sky so clear and there was literally a blanket of stars which I have never before seen at home, it really is spectacular. We will certainly be going back! Our two nights away left us perfectly refreshed. A wonderful stay. We explored the beautiful countryside around - walked up to the near by waterfall, and had a superb meal at The Hand at Llanarmon. We made use of the cooking facilities in the Cabin and had a wonderful cooked breakfast (it was great to be able to order the breakfast basket so that we didn't have to bring everything with us!). Dawn and Tony were very welcoming and the cabin was really comfortable - the flowers on the table when we arrived were a lovely touch. Thank you! Just returned home from a two night stay in the Terrace Lodge; and can honestly say I wish I was back there now! Greeted by the lovely owner Dawn and friendly dog Jasper. The lodge itself was just perfect. Very cosy, romantic and filled with everything you need. The views are stunning! As there is no electricity the lodge is lit by candles and fairy lights! With this and no wifi etc, its a very good excuse to wind down and totally switch off from the outside world. There is sufficient cooking amenities on the balcony to cook as you would at home; it was the best candlit meal I have had, the setting was perfect. We made a campfire at the back of the lodge and sat there one night star gazing....I have never seen the sky so brightly lit with stars! Breath taking!!! Dawn and Tony have truely thought of everything -cafetiere so you can have filtered coffee, insence sticks, games, kindling, local maps and guides etc. They were so helpful, friendly and hospitalable, but yet were unobtrusive. It was perfect in everyway. Looking forward to our return. Jane and I stayed only 3 nights but had lovely weather and a very quiet, gentle and restful break. We thoroughly enjoyed bbq'ing out on the deck enjoying the clear night sky and peace and quiet. The area provides lots of opportunities for days out - we particularly enjoyed Powys Castle and Lake Vyrnwy. We also made good friends with the cheeky little dog, Jasper, who was always keen for our company when food was in the offering! Dawn and Tony could not have been more accommodating as hosts. Recommended. Despite not being an actual campsite, more of a camp out in a beautiful secluded garden we had a brilliant time relaxing at Wyldwoods. We stayed in the Terrace Lodge which has a full kitchen - even a sink with running water - and we made the most of it, cooking all of our meals here. The garden is superb and backs on to a large woods - perfect for a quiet and solitary wander. Dawn and Tony were helpful, welcoming and friendly yet respected our privacy when required. The addition of the eco-shower will mean you have everything you need for a true glamping experience. We will definitely be back to unwind and escape from the city again soon as the prices are reasonable and the experience lovely. The wood burner kept it really toasty inside too and I'm always cold! We loved every minute of our stay. Dawn, Tony and Jasper were so friendly and welcoming. The lodge provided everything we needed for our stay. An ideal getaway and a perfect location to be at one with nature and beautiful landscapes. We would love to return. Life is short, book the extra night! My wife and I have just returned from an extraordinary three night stay and we are still regretting not booking an extra night. It was very hard to leave and if the cabin wasn't already booked we probably would have stayed at least another night. The cabin is in the most idealistic valley setting and Dawn and Tony create an friendly and relaxed atmosphere. 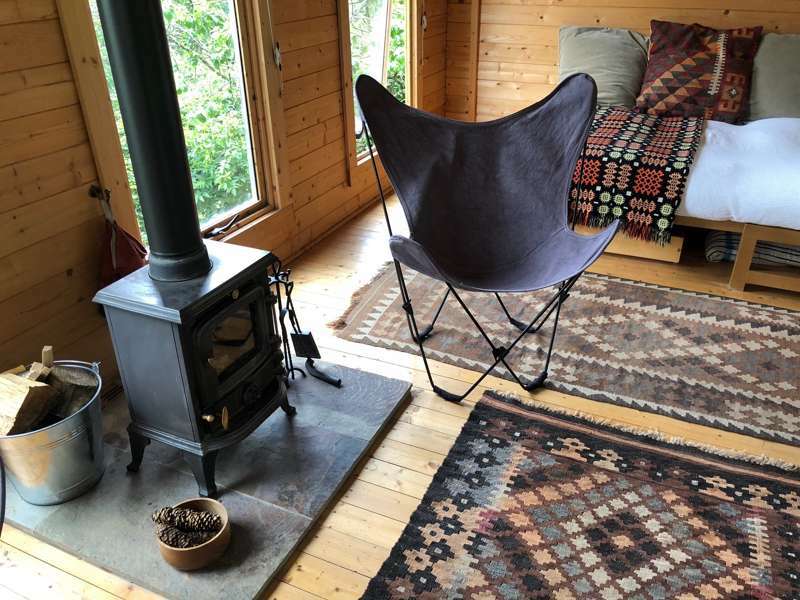 The other reviews do well to detail the wonderful log fire, the delicious breakfast hamper, amount of interesting things to do nearby, and how the cabin is rustic and basic as you would want it but how it offers up everything you'll need. What is almost impossible to describe is the strange sense of nostalgia you get in the valley. Listening to the shepherd's whistle and commands for his border collie echoing off of the hills and the stillness of the starry evenings are like sensory time travel. Or maybe it was just our euphoria of not having phone signal or being connected to the internet. We’ll have to go back to find out and will definitely book that extra night! Dawn & Tony (and Jasper the mini-Schnauzer) are very welcoming and helpful, providing a fabulous welcome pack and breakfast, and offering ideas for where to go (check out the fascinating ancient church/shrine of St Melangell the patron saint of hares, about 30 mins drive away, tucked into the folds of the mountains). I will definitely be back again. I've never felt so refreshed and relaxed after a weekend away! Highly recommend! Delightful hosts, beautiful lodges and fabulous breakfast basket! Tony and Dawn could not be more welcoming and Jasper the dog is an added treat. A quiet get-away-from-it-all; this is a super place to chill out with a glass of wine. Log burners in both lodges provide that rustic touch which makes a holiday special. Definitely will be back for more of Dawn's cake. The little cabin, hidden amongst shrubs and herbaceous borders on a slope in the quietest valley imaginable, was the perfect place to relax and unwind. The pretty interior and cosy log stove made it almost impossible to leave to go exploring in the area! However, I made it to the waterfall at Llanrhaeadr, which was amazing and reputedly higher than Niagara Falls, and also to Llangollen, where there is a preserved railway and a canal right next to each other - I couldn't have wished for more! Dawn and Tony were really welcoming and the table laid for tea, the welcome pack of essentials and small vase of garden flowers, all added to the feeling of being wrapped in a warm, snuggly blanket. Their garden is amazing, too with lots of steps and terraces and beautiful shrubs plus a 'secret' gate into the wild woods beyond. My visit was all too short, but I shall definitely be returning - just try and stop me! What an idyllic retreat in a truly magical setting. 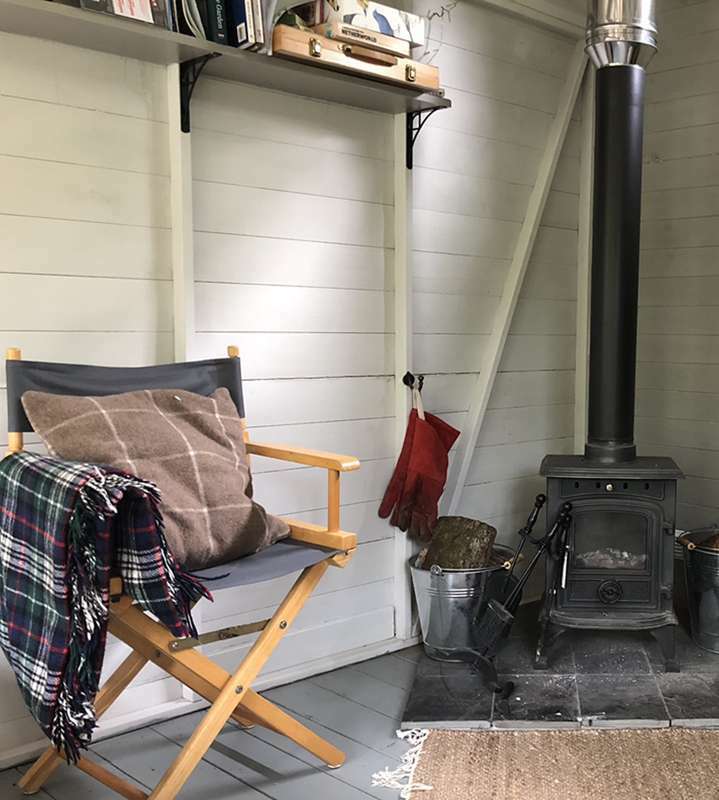 The Cabin was equipped with everything needed for comfort and ease and the log burner made it really cosy. The warm welcome provided by Tony and Dawn was lovely, nothing was too much trouble for them. The welcome and breakfast packs were great and helped with the total relaxation of the holiday. The Cabin was private, tucked into a secluded area of the large garden and the amenities were excellent and well maintained. The surrounding area was beautiful and peaceful, with plenty of things to do and places to visit. Conversely, the Cabin was a great place just to be and not do too much. Overall, it is a fabulous place to step out of your everyday life and to experience the rich beauties of nature and peace. Our stay in the Lodge was idyllic, when we turned off from Moelfre onto the road through the woods beside a lake it was like entering a magical realm. The name says it all, Wyldwood retreat. Even though the weather was not great, we were warm and cosy in the lodge, woken by birdsong each morning. Nice to have the woodstove, and the stunning views from the balcony/deck area.Walking in the gardens and the adjoining woodland we did not see a soul, but Dawn and Tony were helpful and really hospitable. We had excellent breakfasts and there was a lovely welcome pack when we arrived, so we did not need to go out in search of milk and things right away. The set up was perfect and all our needs were catered for. We did go out to discover Lake Vyrnwy and the highest waterfall in Wales, which were just beautiful, but we would have been content to stay put in the lovely gardens, enjoying the local produce we were able to buy from Tony's garden and from a local farm shop. Ideal if you want to step away from the world for a time, we will definitely be going again! 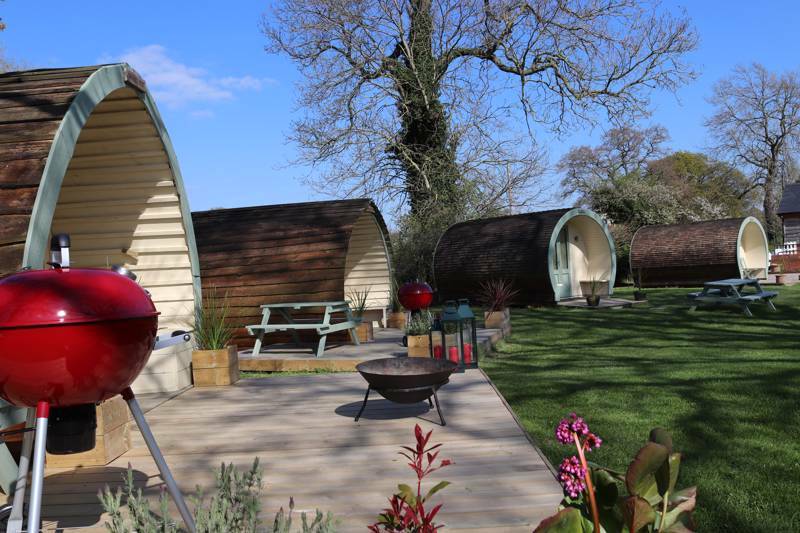 2 glamping lodges, one on a private terrace, the other in its own private garden. The lodges sleep a maximum of 2 adults and 1 child. 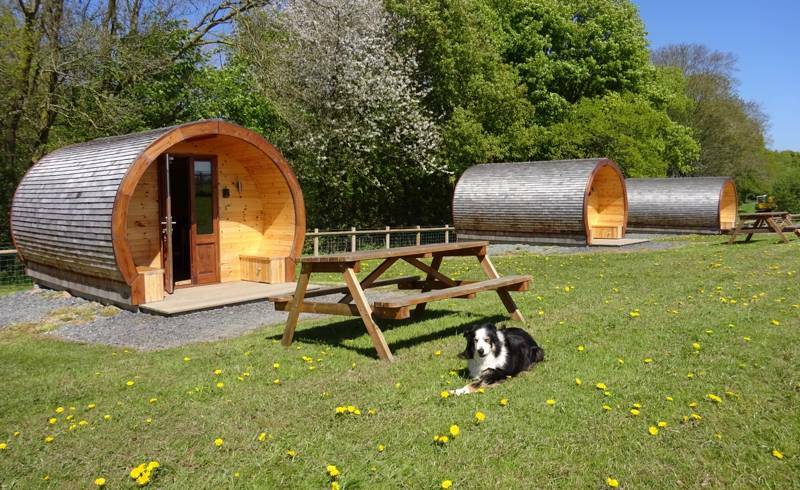 Small dogs are welcome at an additional cost of £7.50 each per night. Both the Terrace Lodge and the Cabin feature one large double bed, The Terrace Lodge also has a fold out bed for a child. All the beds have feather duvets and pillows and luxurious Egyptian cotton bedding. Each has a small wood burning stove and table, chairs, cushions and blankets. Romantic solar, candle, and fairy lights, for evenings and plenty of boxed games and books for cosy evenings in. Each cabin has its own table and chairs for al fresco dining, private gas BBQ, and wood fires chimera, plus pots of culinary herbs. The Cabin is decorated in a rustic style, Inside there is a small and impeccable kitchen, with sink, double hob, grill and fridge. There are all the cooking and serving utensils that you should need for cooking inside or in the private garden. The Terrace Lodge is more contemporary, with an outdoor decking area and floor to ceiling windows. 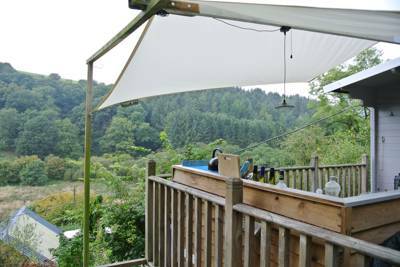 It also has a fantastic, fully equipped decking kitchen covered by a large sail roof, complete with; sink fridge, double hob, oven and grill. There is a separate grassed area with chairs and Chimenea. Shower and bathing facilities in guest bathroom in house, Good quality towels are provided. An average amount of logs for each evening’s fire is provided with each booking, additional bags of logs are available at £5.00 each. A welcome selection including organic tea, herb tea, coffee, instant and filter and milk is waiting for you on your arrival. Shower and bathing facilities in guest bathroom in house, available from 9.00-11.30am and 4.00-9.00pm. It's 5 miles to the village of Llanrhaeadr-Ym-Mochnant (see food & drink), an excellent starting point from which to walk out to Pistyll Rhaeadr (01691 780392), a magnificent waterfall and the highest in Wales. It's around a 3 mile walk along the banks of the river from village to falls, though there is a road leading right out to the falls for a much quicker option. The Berwyn Mountains are nearby as is Lake Vyrnwy – encircled by a B-road that makes for excellent road cycling. To the north east, National Trust owned Chirk Castle and Gardens (01691 777701) is also well worth a visit – the drive takes around half an hour. Guests arrive to a welcome pack of milk, butter, orange juice, tea and coffee. You can also book homemade pasties and soup for your arrival, a “Breakfast Basket” for the morning or a choice of Picnic Hampers for the next day. This full breakfast hamper is an add an additional cost of £18. You will have more than enough for a feast for 2 (often with leftovers). The campsite is also 5 miles from the unspoiled village of Llanrhaeadr-Ym-Mochnant, with local food stores, a fish and chip shop, post office, traditional butchers, restaurant and no fewer than 3 friendly pubs – The Plough Country Inn (01691 780654), The Hand (01691 780413) and The Wynnstay Arms (01691 780210).